Worman & Sheffler, P.A., is centrally located with our offices in Winter Park, Florida (Orlando metropolitan area) which allows us to serve clients throughout the state of Florida. From our offices located at I-4 and Fairbanks Avenue in Winter Park, we frequently travel throughout the state of Florida for depositions, mediation conferences, court hearings and trials, as well as to visit clients at their offices or project location. Our firm is AV-rated by Martindale-Hubbell,* the highest rating offered by the organization's peer review rating system. 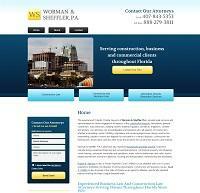 In addition, both of the firm's partners, Robert Worman and Scott Sheffler, are also AV-rated by Martindale-Hubbell. In order to provide personal service and develop lasting relationships with our clients, we choose to limit the size of our firm. Our lawyers have learned the benefits of firsthand investigation, especially in the area of construction litigation. We keep our hard hats close by, and we will not hesitate to visit your job site to gain valuable insight and in-depth knowledge of your project. •Business and Commcerial Law: We offer a wide range of services to business clients, including business formation, transactional work, financing, contracts, operations consulting and litigation. •Construction Litigation: We represent developers, contractors, subcontractors, suppliers, architects, engineers, lenders and other businesses involved in construction disputes.